A 15g organic Falafel made of chickpeas. Generously seasoned with garlic, cumin, parsley and coriander. 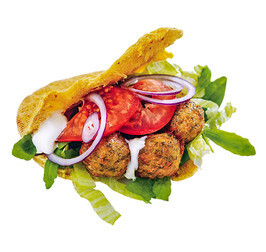 From frozen: Oven 200°C: place the falafel on a ovenproof plate, in the middle of the oven for 12-15 minutes. Microwave (750W):,Heat for approx 1-2 minutes. Depending on quantity. Frying pan:, Heat in a bit of cooking oil on medium heat for 5-7 minutes. St,ir while frying.